Ideally, you have had the opportunity to start your dog training classes when your pooch was a puppy, generally beginning at 10-12 weeks of age (an ideal time for behavioral training and socialization). However, the reality is, many of us adopt dogs who have not been trained or exposed to dog parks and other social places. Many shelter dogs or rescues have been subjected to stressful environments where behavioral challenges and fears can be developed. So, what is the best way to discipline a dog who just will not listen? First of all, let’s put aside the word discipline and focus rather on positive reinforcement and behavior modification through praise-oriented tactics. According to results of clinical studies done by the Journal of Veterinary Behavior, dogs trained only with positive reinforcement exhibited fewer problem behaviors. Furthermore, many dogs will not respond to fear-inciting scolds or yells. In fact, sometimes this will simply increase the behaviors you do not want him or her to exhibit, since the focus, and therefore attention, is placed on the negative rather than the positive. Keep this in mind: your dog – despite the behavior – does want to please you. He or she simply needs to be redirected and encouraged to display the right behaviors. Avoid yelling at your dog with repetitive phrases, such as “No, no, no…” Oftentimes, your dog will be confused about what you want him or her to do and will not associate your reaction with the behavior, resulting in a frightened or more agitated dog (and annoyed neighbors). 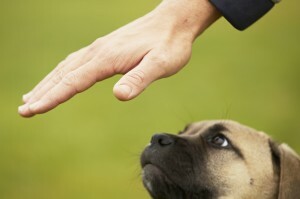 Focus on short, simple one-word commands, such as sit, stay, or drop. When your dog responds with the correct behavior, immediately verbally praise him or her, and/or reward with a ‘click’ from a clicker and a small treat. If the behavior occurs on a leash or during play, simply stop what you are doing and wait until your dog discontinues the behavior, such as jumping up or pulling on the leash. When you resume your walk or playtime, verbally praise your pooch for exhibiting the correct behaviors. When using treats as a reward, try an assortment of treats to avoid losing a bored pup’s attention, and gradually decrease the treats as the positive behaviors become reinforced. Preventative measures are far easier to take than responding to problem behaviors. If your dog displays resource-guarding aggression, avoid giving him or her treats, toys, or other “hot items” when in social settings until the behavior has been corrected. If your dog is prone to aggression, nipping, or biting, we strongly recommend professional intervention, as this can pose a threat to other humans, animals, and your dog. Maintain focus on the behaviors you want to see in your dog, such as walking with a loose leash, remaining calm in the home, and using the dog door to avoid accidents. Take these moments to praise your dog. He or she will love it and the behavior will be associated with something good! If your dog is continuing to display destructive behaviors, Elmhurst Animal Care Center offers a variety of classes and private training sessions that are focused on positive reinforcement and ethical obedience. If you suspect separation anxiety or an underlying health issue, please consider scheduling an exam in advance of training classes to rule out any possible issues and create a tailored behavioral plan for your best friend.